Given the normative privilege granted to technology, has the project of our age from the start been the making of the “God-man” through technological means? The imagination of the Techno-Futurist stretches towards this goal conceptualized by the likes of Ray Kurzweil and other transhumanists and extropians as the singularity of human apotheosis or supersession in machine intelligence. The critique of this technological telos, born with it, dreamed its own posthuman divinity, contra technology. Founded in a Platonic soul-body divide it asked if the immortality of the body or the capacities which defy human limits could be achieved through the magical powers of Nature. This idea was taken up in Romanticism by rejecting rationality in an attempt to commune with the creative forces couched within the subconscious mind. A different path of perfecting the human, by overcoming rather than surrendering to nature became the project of the Enlightenment. However, both movements in failing to resolve the soul or mind/body problem have proven equally perilous in fulfilling their promises of progress and perfection. In contrast to these historical narratives of progress are the prophetic announcements that herald a new being on the horizon, albeit one that overcomes the soul/body divide by overcoming the human. This trajectory is found in the overman of Friedrich Nietzsche, the supramental being of the Indian yogi-philosopher Sri Aurobindo, or as more recently contextualized by Gilles Deleuze through the“superfold,” the result of the folding into the human subject of the rhizomatic triplicity of genetic code, information technology, and a language at the borders of signification. The triumphalist extension of the human body through technology, continuing the Enlightenment project, has today emerged as the dominant narrative of our future. The negligence of human embodiment in this technocentric narrative has been voiced by those with concerns for human subjectivity and affect such as digital studies theorist Katherine Hayles. Others narratives however, such as Donna Haraway’s cyborg manifesto view the posthuman through a cyberfeminist lens. This conceives an emergent evolutionary being appearing at the twilight of humanist history to breach hegemonic differences and dissolve patriarchal dualisms that have traditionally dominated Western civilization. Thinking the posthuman through such narratives follows a Derridean reading of a “becoming other” by fissuring the Platonic dichotomies of inside/outside, self/other, speech/writing, anamnessis/hypomnesis. Other voices braiding the technical and the subjective have inquired if the two can be thought together and not in opposition or in subordination. Such a lineage of cultural theorists may be traced to Gilbert Simondon with his influence on Gilles Deleuze and Bernard Stiegler. The human-cosmos interface served by technology is seen here as a means of transindividuation, amounting to a phenomenology of the lifeworld of technical objects. With colonialism and the creation of east-west/north-south axial divides, a new ethics of the transhuman presents itself. The narrative of technological perfection, a seemingly democratic gesture of modernity, hides its imperialistic genealogy, the creation and personalization of privilege and its tagging to the circulations of global capital. To what extent are such discourses of human exceeding germane to the postcolonial consciousness? What impact does neo-liberal techno-capitalism have on the ethical appropriateness of “third-world” nations to imagine a telos beyond the human which embraces technology? Contemporary postcolonial thinkers, such as Ashis Nandy, Shiv Visvanathan and Gayatri Spivak have skirted these possibilities while Vandana Shiva has faced down the realities of the new colonizing project in the genetic mutations, transgenic organisms and patented genes of global corporations who extract maximum surplus value from native soil while suiciding indigenous farmers. A consideration of the creative expressions related to each of these trajectories in literature, film, art and performance forms another dimension of the imagination of the margins of humanism. If the shaman dreamed the hybrid entities of human-animal or human-spirit possibilities, today’s magi grapple with machine intelligence and the subjective possibilities of silicon lifeforms. The popular imagination is saturated with the fascination for mutants and hybrids, whether in literature, film or video games. What do werewolves, zombies and cyborgs have in common with humans? Can an ethics and aesthetics of transhumanism be derived from an imaginary consideration of such beings and their encounters with humans, and what purposes would it serve? Many contemporary writers, film-makers, video game designers, multimedia and performance artists today concern themselves with this question. “Beyond Man: Monsters, Mutants and Lonely Machines” proposes to be a three-day international conference planned for 21-22 February 2014 to address, critique and further these trajectories and aspects of the border-crossing between the humans and their alter-entities. The first of its kind in India, it will seek to explore the various dimensions of this question and their representations; but also bring an important postcolonial perspective to bear on it. Are we to embrace the specter of technological mutation? Reject it for a spiritual transmutation? Come to grips with an inevitable and invisible transformation? Develop an ethics and an aesthetics of the beyond-human? Participants will be organized in forums based on themes. Richard Carlson, Non-Linear Systems, Port Angeles Wa. Conference attendance is free, courtesy of sponsors. 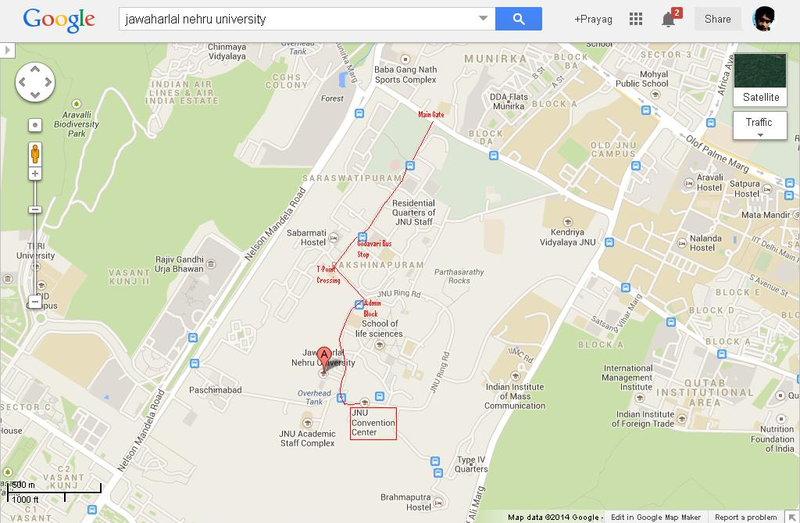 Conference Venue: Jawaharlal Nehru University Convention Centre (see map). Transport: Please see maps (below) for directions on how to get from the Indira Gandhi International Airport/ New Delhi Railway Station to the location of the conference: the JNU Conference Centre. Registration: Please contact Mansi Tikku (+919999794327)/Kumam Davidson (+919560474429) or come to the Conference venue. Accommodation: For out-of-station or international attendees, please look up hotels nearby. Vasant Continental is the nearest hotel we can recommend. The rates, and other details may be found on this website, and you can also make your booking through it: http://www.booking.com/hotel/in/jaypee-vasant-continental.html. Meals: Complimentary tea, lunch, and dinner each day, shall be served to all registered participants at the venue of the conference itself. Sponsors: JNU (UGC SAP at the Centre for English Studies), ICSSR, Nalanda International, Samvad India Foundation, Richard Carlson.